The Qualifiers day wasn’t too bad either, the atmosphere at these all girls comps is always so great, supportive and fun, it’s always good to be a part of it. There was quite a bit of waiting around for runs, we got 4 all together in the 2 hour session, I had 1 clean run in the whole lot, luckily, I was just happy to be getting some nice 3′s on the top jump and managed a few melons and bs to switch 50/50 on the bottom up down picnic table jib. 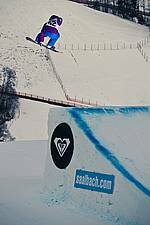 UK ripper Claire Frost had an amazing final quali run including a fs7 melon off her TOES on the massive booter to bs3 on the bottom kicker, she is such a great rider she even managed this with the flu! go on Claire!